Falls represent a considerable public health problem, especially in older population. We describe and evaluate data-driven operations research models for detection and situational assessment of falls and near falls with a system of wearable sensors. The models are formulated as instances of the multidimensional assignment problem. 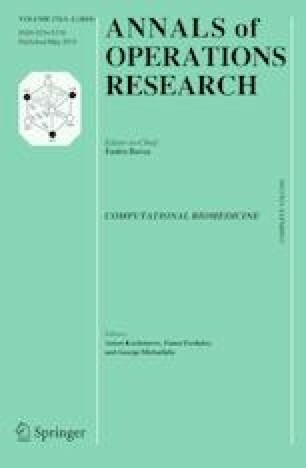 Our computational studies provide some initial empirical evidence of the potential usefulness of this new application of the multidimensional assignment problem. The authors gratefully acknowledge the support from the National Science Foundation grant EEC-1342415. Centers for Disease Control and Prevention, National Center for Injury Prevention and Control. Webbased Injury Statistics Query and Reporting System (WISQARS). http://www.cdc.gov/injury/wisqars/ (online) Accessed August 15, 2013. World Health Organization. Are you ready? What you need to know about ageing. World Health Day 2012—Toolkit for event organizers. http://www.who.int/world-health-day/2012/toolkit/background/en/ (online) Accessed on January 21, 2016.